Perfect Essentials for a 4th of July Celebration! Looking for the Perfect Essentials for a 4th of July Celebration? Joss and Main has the best essentials to create an outdoor oasis on your veranda, patio, or porch for the most fabulous 4th of July Fete. They have contemporary place settings, serveware, ottomans, glowing lanterns, and more in red, white, and blue! 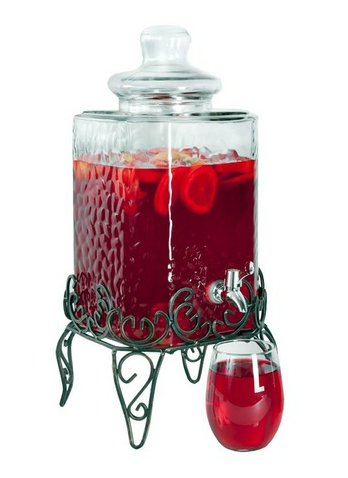 I absolutely adore the Bess Beverage Server as shown above. It would be great with a Layered drink of red, white, and blue. Fill your glass with ice. Poor the following slowly to create the fun red, white, and blue layers. Start with the pina colada, add the Gatorade fruit punch, and finish the last layer with G2 Blueberry Pomegranate. These would be perfect if you plan to be the best host this Independence Day! What are you doing to celebrate the 4th of July?